I love all of the different activities that precede a holiday and become a tradition. Whether you celebrate Harvest, Halloween, and or Thanksgiving, fall festivities call for pumpkins. 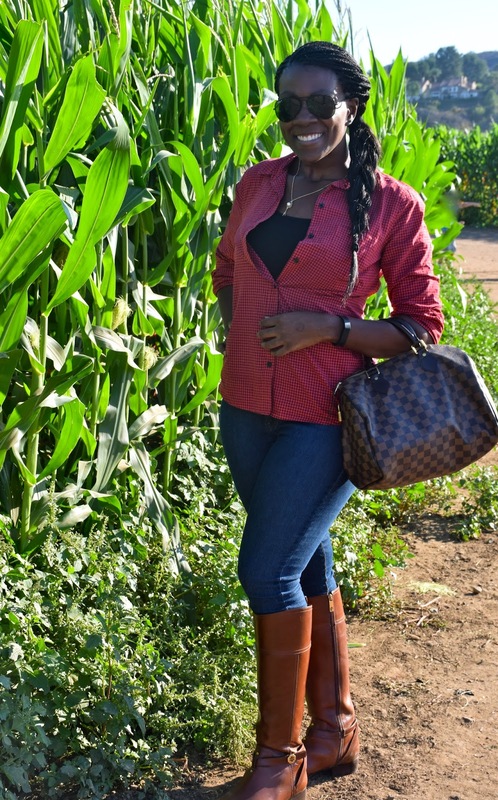 My pick is to hit the pumpkin patches in plaid; I love holidays and festivities are my favorite part. This past weekend I had the opportunity to visit Tanaka Farms, an actual working farm with veggies, tractors, corn mazes, and of course pumpkins. I opted for a white pumpkin as they are a chic "ghostly" alternative to the traditional orange pumpkin. But not to worry, I also selected a traditional bright orange pumpkin as well. 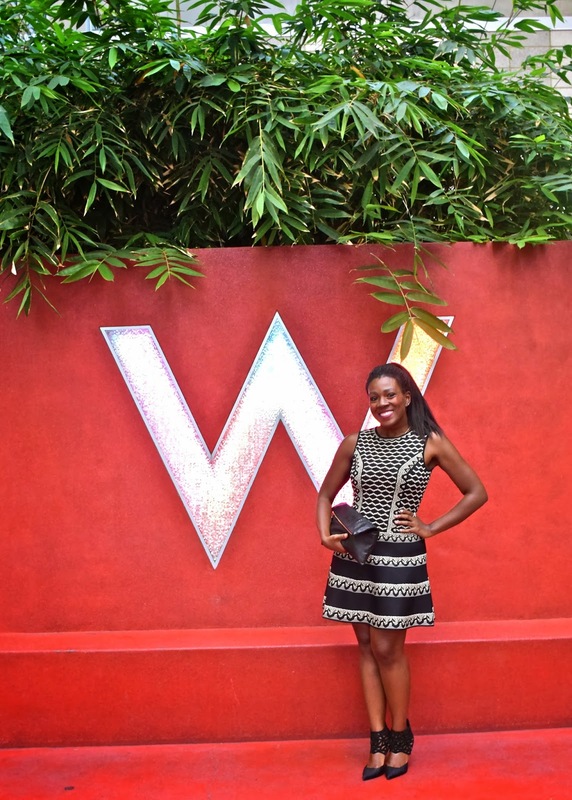 I hope you enjoy this weeks wardrobe highlights in addition to your holiday! Remember to be sassy, savvy, and safe this weekend! As temperatures slowly drop and leaves begin to change colors, outerwear becomes a focus.That in between seasonal period prior to winter is often fondly referred to as "sweater weather". Let's face it, the idea of warm, fluffy, and cozy garments are what fall is all about. With that in mind, I wanted to highlight a few sassy sweaters I have "fallin" for this season. 1. A classic cardigan is a wardrobe staple and makes a great companion. This knit cardigan is a versatile multi-tasking piece! 2. Decorative sweaters are ideal for crisp nights out on the town. 3. A classic pull over sweater is great with a pair of jeggings and a statement necklace. What I like to call the sassy fall uniform. 4. Take a savvy approach to fall styling and layer with a sweater vest/wrap sweater. 5. This cable knit sweater dress is the best of both worlds as this is also a turtle neck. Combining two on trend aspects in one quick change. This is an instant outfit just add a pair of sassy boots. I hope these "sweater weather" styling highlights and tips come in handy this season. 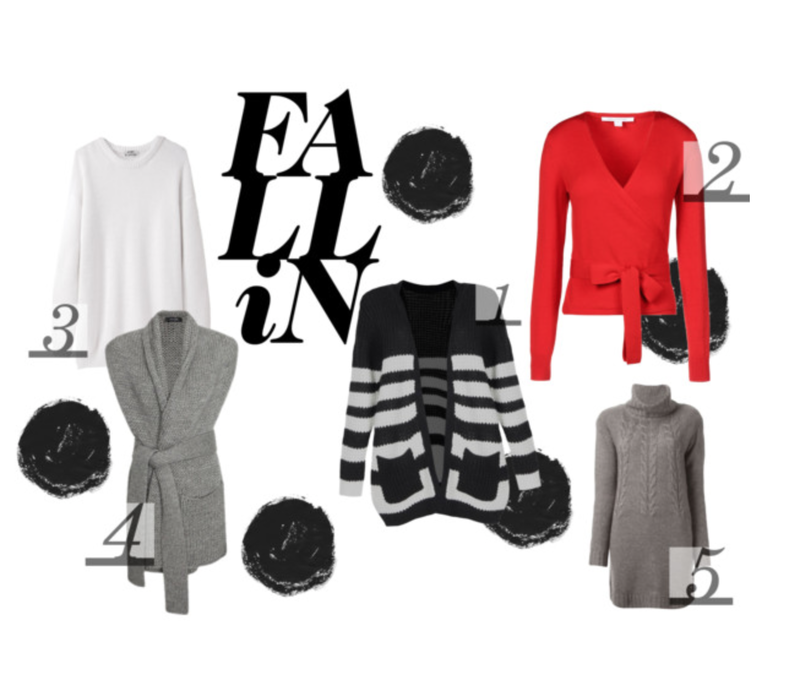 Which sweater have you "fallin" for? 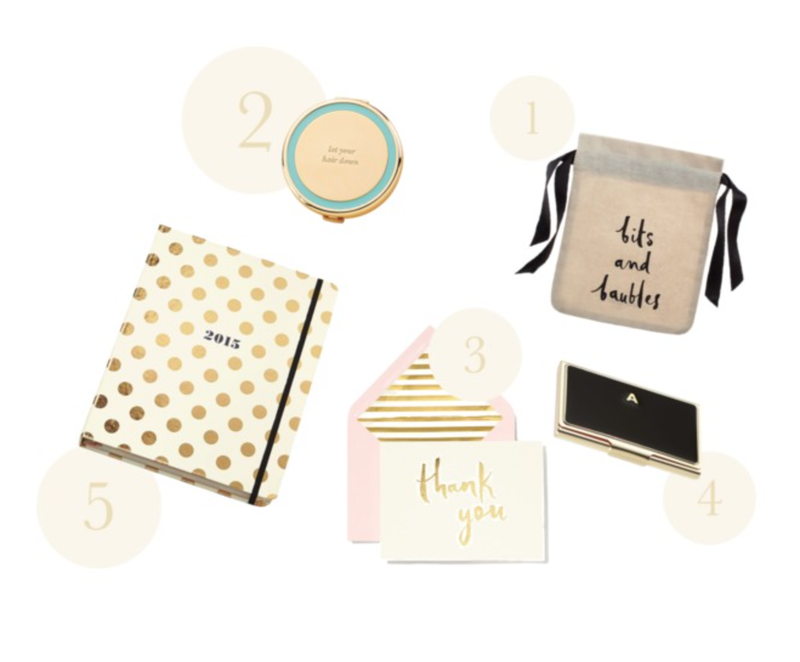 They say sharing is caring who ever they are, anyhow I wanted to share a few of my current favorite Kate Spade New York pieces.Focusing on odds and ends you know bits and baubles after all it is the little things in life! 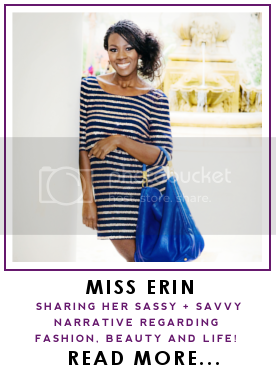 In addition I am participating in a sassy Kate Spade giveaway you can enter to win using the giveaway widget below with a ton of savvy ways to enter.You can enter daily so be sure to come back often to earn additional entries. I would love to know what you are currently coveting from Kate Spade,let me now it the comments below and best of luck! 1.Bits and Baubles Jewelry Bag- For on the go jewelry storage. 2. Let Your Hair Down Compact - As a reminder to live a little and let your hair down. 3.Paint Brush Thank You Card Set- Manners are always sassy and savvy! 4.Business Card Holder-The perfect place to store your calling cards. 5.2015 Agenda - Thinking and planning ahead in style. By the way if you simply cannot wait to get you hands on a few sassy Kate Spade bits and baubles you can shop the friends and family sale for 30% off your entire purchase in boutiques, outlets and online with code F14FFUS all weekend the sale ends Sunday Oct 19th 2014 at 11:59 PT. I’ve teamed up with my blogger friends to bring you a giveaway with an amazing prize for one lucky reader! 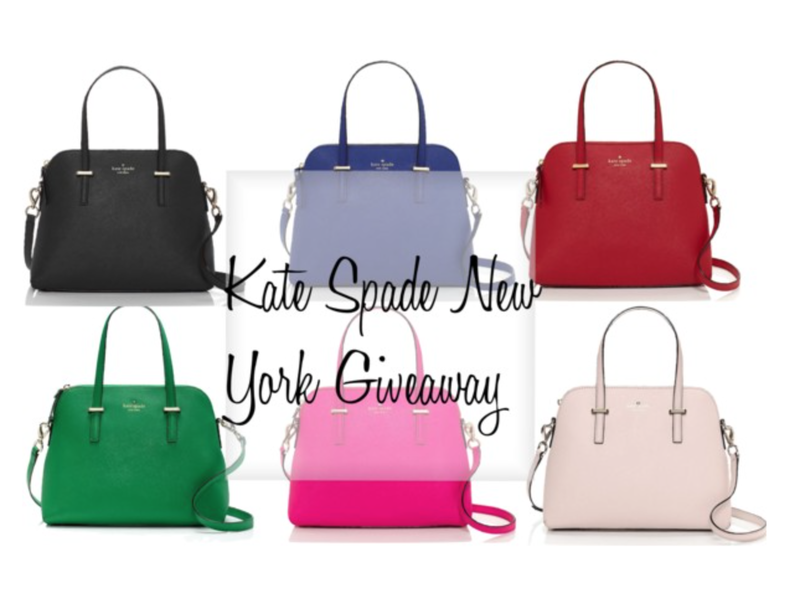 We’re giving away a $300 Kate Spade gift card -- and you just might be the lucky winner! Finally the weather is cooling down. I hope sweater weather is here to stay for a bit! 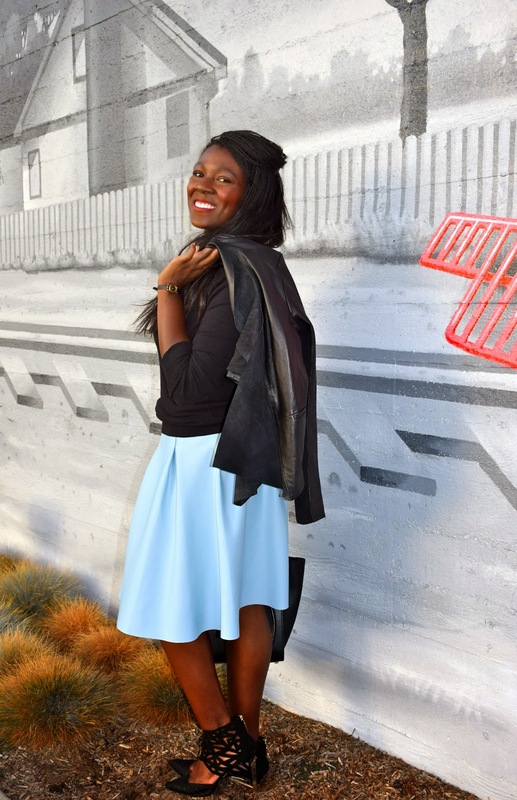 This week I decided to pair a few opposites.. pearls and leather.This look was a fun one as I carried the opposite theme thought the look paring my ultra feminine sky blue scuba midi with a leather jacket. A look like this will carry you from Fall all the way through Winter. I hope you enjoy my take on styling traditionally edgy and feminine pieces together. It is October and that means it is time to think pink! October is breast cancer awareness month and many designers and brands are taking part in the cause to increase awareness and to find a cure all month (and year) long. I am notoriously not a huge fan of the color pink; the month of October is the one exception. Shopping for a cause is such a savvy way to increase awareness and contribute to finding a cure for breast cancer. Last week I was given a unique opportunity to attend the third installment of "Get Chic With Chagoury". The event was held at the Los Angeles boutique, where I had the pleasure of meeting Gilbert Chagoury. He began his successful design career at the house of Christian Dior in Paris, maybe you've heard of them? Since he has ventured out on his own creating his self named line that caters to a high end and celebrity clientele. His celebrity client roster includes Eva Longoria, Carrie Underwood, Katy Perry, Lisa Vanderpump, and Rhianna to name a to name a few. Driven by the passion to dress what Chagoury refers to as the "every day woman" the designer has recently ventured into ready wear clothing. His current collection of ready to wear pieces can be found at his boutique located at: 8378 Melrose Ave. Los Angeles, Ca 90069. This week I have styled a feminine skirt with unexpected traditionally masculine pieces. I simply cannot get enough of chambray button downs and loafers are classic and comfy. The seasons have officially changed however; the weather shows no signs of cooling down here in sunny California. 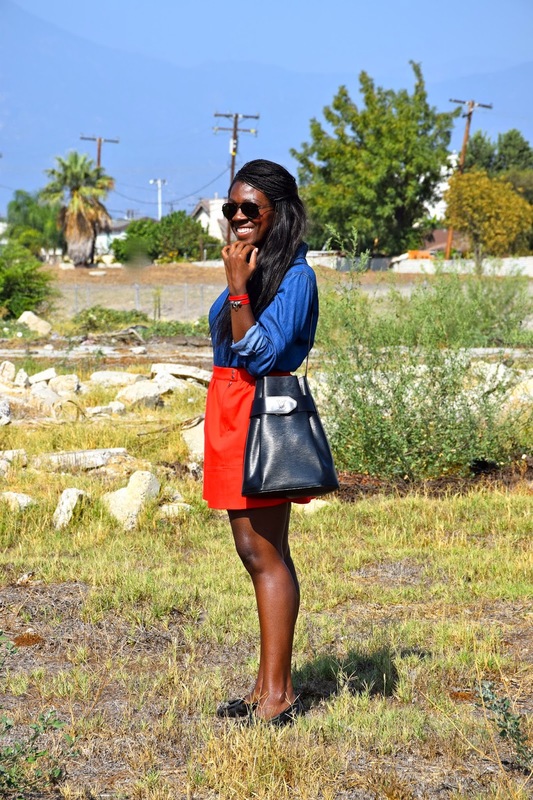 This seasonally transitional look hints at the upcoming season of fall. While providing a bit of relief from the red-hot triple digit temperatures we have been experiencing. I hope where ever you are the weather is pleasant and that you are having a great week!